The ink wasn’t even dry (or the bits weren’t even embedded in the Cloud) yet on the 2 Comments about a new theory that Stonehenge once stood in Wales before being moved to Wiltshire when a cry rose up from other archaeologists who claim that it was glaciers, not humans, that pushed the monoliths to their current resting place in Wiltshire. Who’s right, who’s wrong and what’s the betting line on the fight? The stone of contention in this argument is foliated rhyolite debris – fragments of thinly-layered volcanic rock that were found at both sites, prompting the UCL team to declare that they came to Glastonbury with the bluestones from Wales. Dr. John’s team says the Irish Sea Glacier brought the foliated rhyolite debris (a great name for a heavy metal band) 500,000 years ago. An expectation or conviction that ‘engineering features’ would be found has perhaps led to the unconscious fashioning of archaeological artifices. Ouch! But Dr. John doesn’t stop there. On the contrary, there is substantial evidence in favour of glacial transport and zero evidence in support of the human transport theory … We think the archaeologists have been so keen on telling a good story here that they have ignored or misinterpreted the evidence in front of them. That’s very careless. They now need to undertake a complete reassessment of the material they have collected. Dr. John has taken the lead. Back to you, team from University College London. Evidence of quarrying for Stonehenge’s bluestones is among the dramatic discoveries leading archaeologists to theorise that England’s greatest prehistoric monument may have first been erected in Wales. It has long been known that the bluestones that form Stonehenge’s inner horseshoe came from the Preseli hills in Pembrokeshire, around 140 miles from Salisbury Plain. Now archaeologists have discovered a series of recesses in the rocky outcrops of Carn Goedog and Craig Rhos-y-felin, to the north of those hills, that match Stonehenge’s bluestones in size and shape. They have also found similar stones that the prehistoric builders extracted but left behind, and “a loading bay” from where the huge stones could be dragged away. Carbonised hazelnut shells and charcoal from the quarry workers’ campfires have been radiocarbon-dated to reveal when the stones would have been extracted. Prof Mike Parker Pearson, director of the project and professor of British later prehistory at University College London (UCL), said the finds were “amazing”. Parker Pearson heads a project involving specialists from UCL and the universities of Manchester, Bournemouth and Southampton, among others. 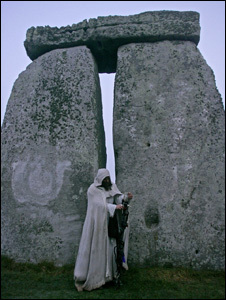 Their findings are published on Monday in the journal Antiquity alongside a new book by the Council for British Archaeology titled Stonehenge: Making Sense of a Prehistoric Mystery. Prof Kate Welham, of Bournemouth University, said the ruins of a dismantled monument were likely to lie between the two megalith quarries. “We’ve been conducting geophysical surveys, trial excavations and aerial photographic analysis throughout the area and we think we have the most likely spot. The results are very promising. We may find something big in 2016,” she said. The long-distance transport of the bluestones from Wales to Stonehenge is one of the most remarkable achievements of Neolithic societies. The archaeologists estimate that each of the 80 monoliths weighed less than two tons and that people or oxen could have dragged them on wooden sledges sliding on rail-like timbers. Parker Pearson said people in Madagascar and other societies were known to have moved such standing stones long distances and that doing so created a spectacle that brought together communities from afar. 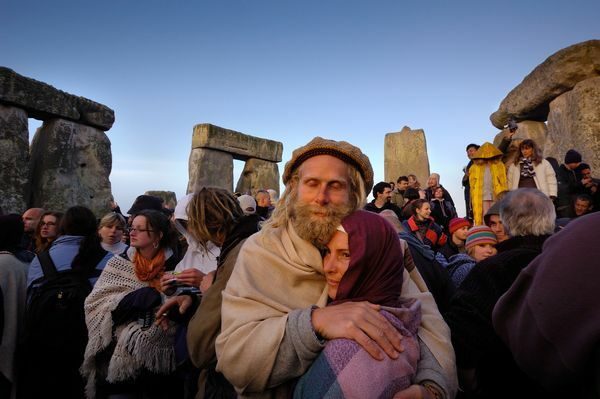 “One of the latest theories is that Stonehenge is a monument of unification, bringing together people from across the many parts of Britain,” he said. He recalled the moment he looked up the near-vertical rock-face and realised that this was one of the quarries. “Three metres above us were the bases of these monoliths that were actually sitting there ready simply to be lowered out of their recesses,” he said.